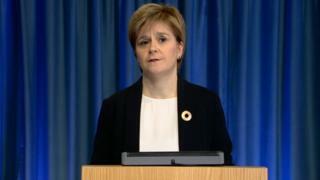 First Minister Nicola Sturgeon has urged people not to allow terrorism to triumph after the Manchester bombing. She was speaking after a late night meeting of the Scottish government’s resilience committee, which discussed security at public events. Scottish teenager Eilidh MacLeod remains missing while her friend Laura MacIntyre suffered serious injuries. Six people were also treated at Scottish hospitals after returning from Manchester following the attack. Four of those patients have since been discharged. Two remain in care, but their injuries are not life threatening. Monday night’s attack at the Ariana Grande concert at the Manchester Arena left 22 people dead and 59 injured. The Scottish government’s resilience committee met for a third time late on Tuesday after the UK’s security level was raised to “critical”, its highest alert status. Ministers were briefed by Police Scotland about the practical implications for Scotland for coming major events such the Scottish Cup Final. In a statement afterwards the first minister said: “While raising the UK terror threat level to ‘critical’ has been judged a necessary response to the despicable attack in Manchester, we must not allow terrorism to triumph. “Police Scotland have already visibly increased their presence in locations such as transport hubs and city centres as a precaution. “Security arrangements for upcoming public events, including this weekend’s Scottish Cup Final, are being thoroughly reviewed and the public should anticipate additional safety measures such as full body and bag searches. She added: “Anyone who was in Manchester and witnessed the terror attack or its immediate aftermath will undoubtedly be feeling stressed or upset. Scotland’s Justice Secretary Michael Matheson told BBC Radio’s Good Morning Scotland programme that preparations had been put in place overnight to ensure “the right level of security was in place”. He said: “Police Scotland have significantly increased the number of armed officers on duty. Political campaigning in the general election has also been suspended for a second day with no events planned in Scotland on Wednesday. Police have named the suspected suicide bomber as 22-year-old Salman Abedi, who died in the blast after detonating an improvised explosive device he had been carrying, at about 22:35 on Monday night. Anyone who has concerns about loved ones should contact the Greater Manchester Police emergency number on 0161 856 9400.